Pretty good in Curator Renolock, you can discover Ironbeak Owl, Stampeding Kodo, Jeweled Scarab, or a random big Beast to fill out your curve. I use this in fatigue warrior. Often gets you a Fierce Monkey, pretty nice. Worth it for every time it pulls out a King Krush to trample my opponent into the ground. Its super versatile too so Hunters can actually get really good use out of it. This card allows beast Druid to work. That probably depends game to game. And that is an advantage of this card, IMO. You can play it on curve if you lack another 4-drop and discover something that fills your next few turns' mana needs, or play it on a later turn and discover something that you can drop alongside. This card is so good for tempo, love it. Disappointing in Hunter, amazing in Druid! Amazing for Druids. I feel like I pull Malorne about half of the time. Even if I don't get him, I find something to play on curve. I'm not saying Beast Druid is going to be the next tournament-level deck, but I've played it with success from Rank 14 to 9. I think the tools are there now for a really solid Druid Beast deck. Seems pretty straight-forward, a significant buff to potential Beast Druid decks, and great for a laugh any time you see a Rogue play it. 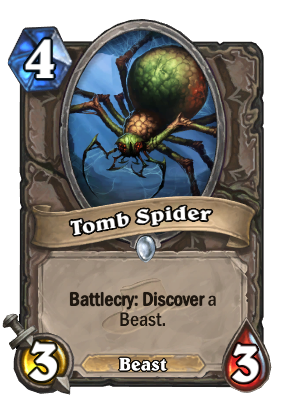 You are pretty wrong about hunter, Tomb Spider cant pull Huffer because Huffer isnt a collectible card. And you forgot about a long list of hunter beasts. I apologize if my face Hunter joke wasn't obvious. Yes, Hunters do have more than 2 beasts. So many more, in fact, that there's really no point in listing them. Golden animation for this card is pretty sick. 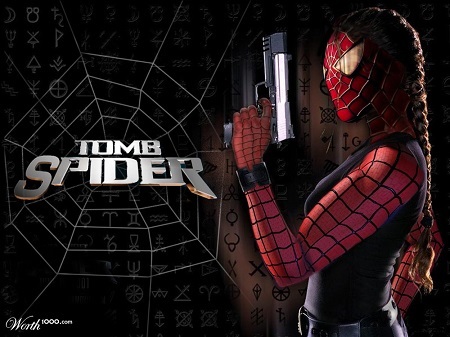 What if you just keep discovering Tomb Spider over and over every time you play it?